Is it a real struggle for you to play guitar fast without making mistakes? Fact: playing guitar fast is only difficult when you are using an ineffective approach to building your speed (such as only practicing guitar slowly and gradually building speed over time – most guitarists use this method incorrectly!). Truth is, it is very easy to play guitar extremely fast in an effortless manner once you understand the best method for doing so. Train your ears/mind to process notes at extremely high speeds so you can instantly hear and correct mistakes in your guitar playing. This is CRITICAL - playing guitar fast without this skill will only make your playing sound like a noisy mess. Make your guitar speed “usable” in real life playing scenarios (so that your fast guitar playing sounds musical and expressive). Use speed bursts to minimize excessive tension in your body, so you can build guitar speed in the easiest way possible. Totally eliminate the lazy/inefficient movements in your hands that slow down your guitar playing. 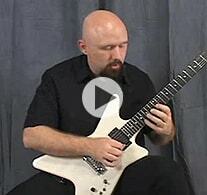 Learn how to effortlessly play fast on guitar using highly effective guitar practice methods. Simply enter your name and email, then click the "Show Me The Video" button to enter. All information is kept 100% private and confidential.